Our Tradewind Trolly Shower Curtains will need a shower liner! Catch a ride on the Tradewind Trolly to paradise. DM399 - Tradewind Trolly has a blue background with tonal hibiscus flowers with an assortment of tropical motifs abound. Woody cars, wooden surfboards, multi-colored surfboards, and palm trees swaying in the trade winds. This design has everything! Our fabric tropical shower curtains are made with 100% cotton Hawaiian print material, so a shower liner will be needed for your tropical shower curtain. 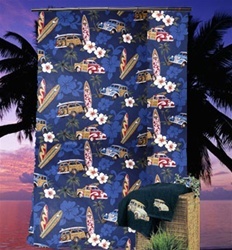 Tropical shower curtains measure 72" wide x 72" long. Tropical shower curtains come with matching fabric ties to use with your existing shower curtain rod, or your tropical shower curtain can be attached with almost any shower curtain hook available. We have coordinating tropical shower curtain hooks available here at our online store if you want a fun Hawaiian theme for your bathroom. Only $39.99 each. Bring home some aloha with a tropical shower curtain! Click on the photo above for a larger view or scroll your mouse over the Hibiscus shower curtain picture for detailed product shots. If you have any questions or concerns about Hawaiian decor, or want to order over the phone, please remember you can always call us at (949) 370 - 6535 or chat online with one of our tropical shower curtain experts!